City Garden Olympus is situated on a prime 8 Rai / 12,800m2 inner-city plot of land with dual access to both Soi Pattaya Tai 1 and South Pattaya Roads and is comprised of 1,060 units spread across 6 low-rise, 8 story buildings with a neoclassical Mediterranean architectural design. The project has an impressive list of features, such as 5 swimming pools, set amongst lush flowered gardens and open walkways with over 700 square meters of commercial space for numerous shops, cafes and restaurants. Each of the 6 low-rise buildings is uniquely named after Mediterranean cities, regions and/or gods to reflect the rich heritage and culture of this geographical region. Whereas the individual units themselves range in size from 24 to 32 square meter, 1 bedroom condo apartments to combined 53 square meter, 2 bedroom condo apartments. 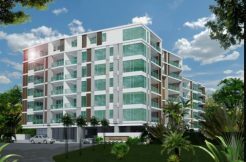 The Developer, namely the Global Top Group Co.,Ltd first emerged onto the local Pattaya residential condominium development scene back in 2009 when they completed their first project “City Garden”. This widely respected and trusted developer has since gone on to complete numerous other widely successful projects mostly under the “City Garden” brand such as “City Garden Tropicana”, “Paradise Ocean View”, “City Garden Pratumnak” and most recently “The Cloud”. Whereas both “City Garden Tower” and “City Garden Olympus” are presently under-construction with the former being scheduled to be completed in late 2018 and the latter in mid to late 2020. Thanks to this developer unwavering attention to detail and emphasis on quality both in terms of workmanship and materials I firmly believe that City Garden Olympus will prove to be yet another success story for this multi-award winning developer. 5 Swimming pools set amongst large open walkways and lush flowered landscaped gardens. 2 Jacuzzis, being 1 on the North and 1 on the South side of the project with therapeutic bubbles and jets. 6 Fully-equipped sky gymnasiums and yoga rooms being 1 on top of each condo building with panoramic city views. 2 Turkish style sauna and steam rooms. 600 Meter long jogging track. 7000 Square meters of commercial shopping and restaurant spaces. Dedicated children’s play area and games room with snooker and table tennis tables. Miniature golf and putt putt range. On-site juristic office and rental management service. Built in European kitchen with cream granite counter-tops together with glass splash backs and a single stainless-steel recessed sink. Fitted hob and slim-line extractor hood, being a 2-plate and 4-plate induction hob in a 1 and 2 bedroom unit. Fitted convection oven included in the 2 bedroom condo apartments. Matching fitted laminate wardrobes with internal drawers, shelves and sliding doors in the bedroom(s). Finished bathroom(s), being 1 in a 1 bed and 2 in a 2 bedroom condo apartment with cream granite sink counter-top(s), white modern oval porcelain sink(s), under-sink cabinet(s) and back lit vanity mirror(s) together with shower(s) and safety glass shower enclosure(s). High quality cream 60cm*60cm ceramic floor tiles throughout. Private balconies with ornate steel balcony railings for optimal pool and/or city views in every condo apartment. ‘Star-Aire’ branded or equivalent slim-line air-conditioners, being 2 in a 1 bedroom and 3 in a 2 bedroom condo apartment. 1-Bedroom/1-Bathroom Units (Small): 24 Square Meters/258 Square Feet. 1-Bedroom/1-Bathroom Units (Medium): 32 Square Meters/344 Square Feet. 1-Bedroom/2-Bathroom Units (Large): 56 Square Meters/602 Square Feet. 2-Bedroom/2-Bathroom Units (Large): 70 Square Meters/753 Square Feet. Family-Mart and Seven-Eleven convenience stores: 3 – Minutes (Walking). Tuk Com IT Shopping Center: 8 – Minutes (Walking). Walking Street: 5 – Minutes (Car). Royal Garden Shopping Center: 7 – Minutes (Car). Central Festival Shopping Center & Pattaya Beach: 8 – Minutes (Car). Pattaya Memorial Hospital: 9 – Minutes (Car). Pattaya Floating Market: 15 – Minutes (Car). Mimosa: 20 – Minutes (Car). Siam Country Club & Phoenix Golf Clubs: 25 – Minutes (Car). Silver Lake Vineyard, Golden Buddha Mountain and Ramayana Water Park: 25 – Minutes (Car). U-Tapao International Airport: 45 – Minutes (Car). Bangkok: 90 – Minutes (Car). Developer: Global Top Group Co.,Ltd. No. of Floors: 8 Floors, 6 Buildings. No. of Units: 1060 Units. Project Land Size: 8 Rai/12,800 Square Meters. Water & Electric Meter Security Deposit: 7,500THB (Estimated). Transfer Tax: 2% Transfer Tax Split 50/50 Between Buyer & Seller. Stamp Duty, Special Business & With-holding Tax Paid by Seller. Completion Date: Qtr 4, 2020.